Welcome back! We hope you had a good holiday break – we certainly did. It’s always good to get some time away and be able to put your feet up for a little while. But its straight back into it for this edition for KartOz, as the year starts up again in earnest! It’s with great sadness that KartOz learned of the Queensland NSW, Victorian and WA flooding. Such a disaster is devastating to the community and KartOz extends its deepest sympathies to anyone that has been affected. As you’ll no doubt be aware, our big feature in this edition every year is our KartOz Top 50. It’s here where we compile all the best drivers from across Australia into one big list that everyone is straining to get into. There were a few surprises as we tallied up the results, and a few big movers as well, so check out our huge feature article! In this edition you’ll find we’re the full bottle on a pair of State Titles; the South Australian State Titles and the Tasmanian State Titles. Both were great events run with solid numbers, with some really fine driving on display. Speaking of state titles, we’ve also got a report on the Victorian Closed Titles, where Garden State residents traveled to Cobden Park Raceway to compete for a Red plate. It was a competitive race meet, as the Victorian ones tend to be – see who walked away victorious in our report! Be sure to check out our report on the Festival of Speed, an event that had WA sandgropers salivating. At it were both Mark Webber and Daniel Ricciardo and a host of other motorsport identities, with WA karting also getting a great time in the sun! Finally there’s our feature on the new DP Karts lead driver Jaidyn Job. Jaidyn is a well-deserving recipient of the sponsorship, as our interviews with Greg Woodrow from Mygale, Craig Holowell from DP Karts and the young man himself reveal. Plus, as usual, we have heaps of race reports from around Australia and worldwide. 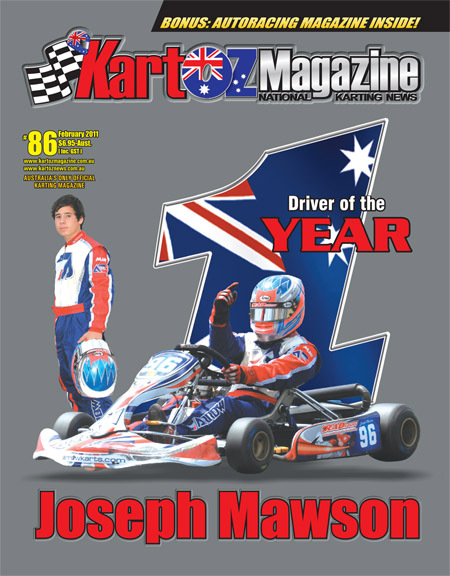 Look for the cover featuring Joseph Mawson the KartOz #1 driver of 2010. There’s something for everyone in KartOz Magazine! It really is the absolute #1 Karting Magazine in the country. KartOz magazine is also available in eEdition online at www.kartozmagazine.com.au. You can also keep up to date daily with everything karting by checking out the www.kartoznews.com.au website and forum. Also make sure you get onto our website and submit your driver profiles – just fill out the form and you could get published in the driver profile section of our magazine! Got spare parts to sell? Changed classes recently and can’t shift your old engine? Why not get online and put an ad in our free classifieds, and put your old gear in the magazine everyone reads! Keep sending us your letters ‘To the Editor’ to have your say in the mailbox about anything to do with karting in Australia. And there’s more – as usual there is the monthly EasiTune $300 Giveaway. Remember – you’ve got to be in it to win it! There’s heaps of other great reading inside this month’s issue including our regular monthly features! We hope you enjoy the latest issue of the KartOz Magazine and Auto Racing combined format. It covers all aspects of Australian Karting combined with news concerning former karters now racing in the exciting world of motorsport. FEBRUARY EDITION OF AUTORACING MAGAZINE! Inside KartOz Magazine – We’ve got it all – from Formula One to Formula Ford! Featuring former karters now competing in the world of Formula One, V8 Supercars, V8 Utes, Formula Ford, Formula 3, Formula Vee, Aussie Racing Cars and NASCAR – AUTORACING MAGAZINE has got it all! Race reports, driver profiles and all the latest hot news!